The theme for my freshmen this year is confusion--I've already played Feynman's video below several times, and will continue to play it. We even have a giant paper banana now, usually tacked to the wall when not taking trips through the school. 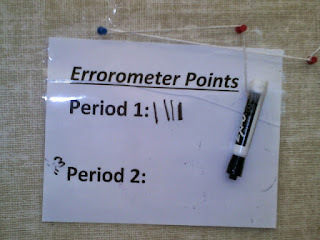 Our error-o-meter continues to run up points--at this point the kids pretty much decide what kinds of errors, ideas, questions, or thoughts earn points. And, blessed be, the kids are now asking better questions than I am, and, at times, tackling them with me just gawking as a spectator. Just don't tell them to list the parts of a cell from memory--I won't, and they know I won't. If you want to have a chat about how membranes work, though, get ready to pull up a chair and listen. I never expected my lambs would truly be interested in how membranes work. I have been away from your blog for some time and I miss it. I think I will have to install and errormeter myself. 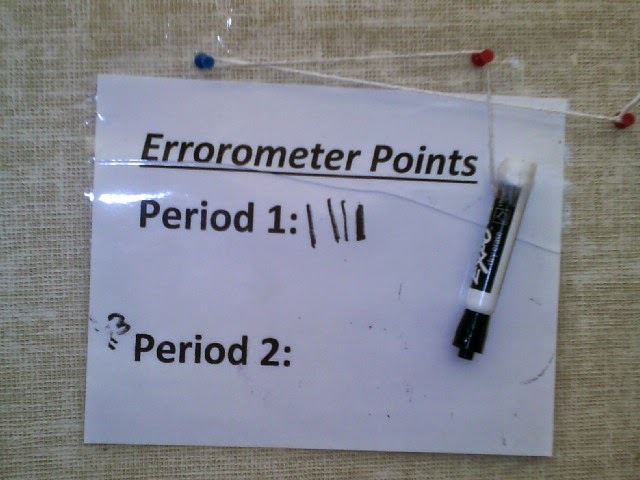 I've not been around so much myself--and do try the errorometer. Kids love it, and it works surprisingly well, at least it has for me. The kids get take pride when I yell "Point!"